Captain Pouic can't get over it. Tibou has disappeared! Of course, you can't see a thing in the darkness on the open sea ever since a cloud covered the moonlight, but the ship isn't all that big after all! "Blimey, where on earth is Tibou, our young, cheerful cabin boy?" "Uh…how should I put it, Captain…" Cruvar weakly replies, avoiding his eyes. "Come on! Out with it!" "What do you mean, up there?" The two men look up at the same time and spy young Tibou hanging on to the very top of the ship's mast, his crying barely audible. "For crying out loud, what the devil is he doing at the top of the mast?" "You told him, Captain, that with his joyful spirit and the passion for life and work that's in his very marrow, he'd soon reach the moon. So he climbed up to see if he could get it!" "Holy rotten octopus, is he an idiot, or what?" "No, he's not an idiot, he's still just a bit young, naïve, and inexperienced." "It's not the moon we have to grab now, but him! It's too dangerous — the sea is starting to really move, and the boat is pitching. He'll be tossed about like a wisp of straw up there." "The thing is…he has vertigo, Captain!" "What! Oh, yes, that's right — he told me so. I'm the one with my head in the clouds, by Jove!" The captain rubs his beard and attempts to think. How can he get the reckless cabin boy down from there? "You have to lure him down, Captain!" "Well, his urge to reach the moon was stronger than his fear of falling, so promise him…well, I don't know…the stars, maybe?" "Stars down here? And not in the sky?" "It's all a question of imagination, Captain, but one thing is sure: we have to get him down before the boat rocks too much forwards and backwards. It's getting urgent!" "Son of a worn-out squid! I have an idea." He positions both hands on either side of his mouth, like a megaphone, in order to have a better chance of being heard. "Tibou! Instead of the moon, I can offer you a star!" "What?" the cabin boy shouts from up high, frightened by the increasingly strong rocking movement of the boat. "If you come down, I can offer you a star!" repeats Captain Pouic. Tibou looks at the sky and, incredulous, wonders how the captain could have reached a star: they seem so far from here. But the captain is such a strong man that he might just be able to do it! And to own a star would be amazing! So, cautiously, inch by inch, placing his feet on the cables and ropes and tightly squeezing the tall piece of wood all along his path, Tibou comes back down. He wants to have his star so much that he finds the strength and clear-headedness he needs to face his vertigo! Below, the captain calmly welcomes him. Even if he is very relieved, he does not embrace him, avoiding too much brotherly contact, as these are all manly sailors! "Well then?" 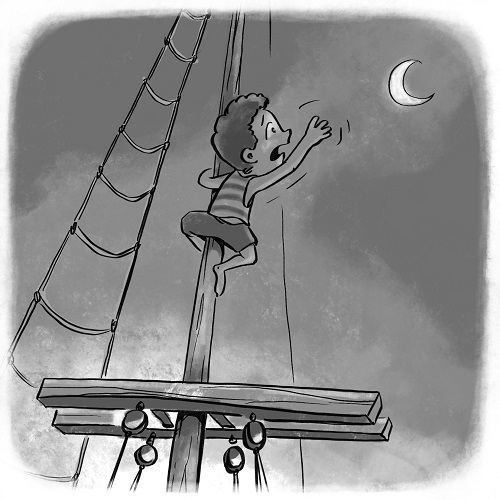 the cabin boy innocently asks after having finally come down from his perilous perch. Captain Pouic grins broadly, plunges his arm into one of the ship's barrels solidly attached by rope, and pulls out…a starfish! C'est époustouflant !! J'ai aimé, l'histoire du garçon cabine qui voulait atteindre la lune, tel qui reçut une étoile de mer en guise de récompense ! Si ça vous tente RDV sur<< Sacré grand-père>>.